If you have diabetes mellitus, your body does not use and store sugar properly. High bloodsugar levels can damage blood vessels in the retina, the nerve layer at the back of the eye that senses light and helps to send images to the brain. 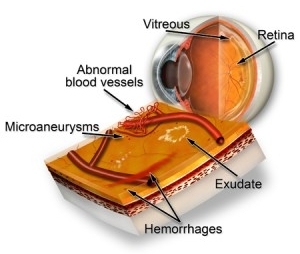 The damage to retinal vessels is referred to as diabetic retinopathy. non proliferative diabetic retinopathy (NPDR) and proliferative diabetic retinopathy (PDR).